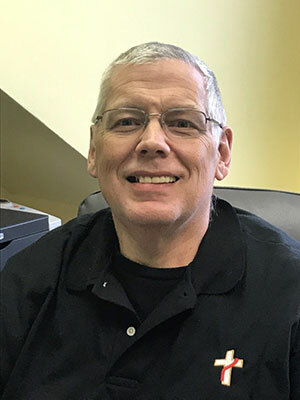 On Tuesday, May 7th the New York State Center for Assisted Living will present its annual Nurse of the Year Award to John Walters, LPN in recognition of his outstanding work at Dominican Village, a residential retirement and assisted living community sponsored by the Sisters of Saint Dominic of Amityville. 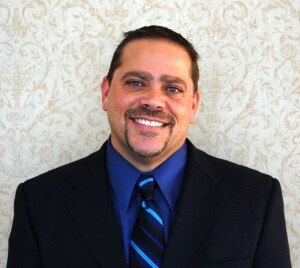 In addition to his LPN license John holds a Bachelors’ degree from the New York Institute of Technology. John is an ordained deacon for the Diocese of Rockville Center and currently serves in St. Anne’s Roman Catholic Church in Brentwood. He is an avid reader of history, a gardener and “an always hopeful Mets fan”. Prior to joining the Dominican Village staff John worked for twenty-five years at the Helen Keller National Center in Kings Point as a bereavement specialist and later at Our Lady of Consolation Nursing Home Rehabilitation Center in West Islip, NY serving persons with Alzheimer’s disease and dementia. While he is part of Dominican Village’s Wellness team John is a leader who listens, counsels and provides support. He implements new ideas and sets reasonable goals for his staff to meet, even surpass. He provides a calm and thoughtful way to approach the many challenges encountered by the staff when dealing with issues that affect the elderly and their care. John’s extensive experience, both professional and personal, allows for staff to trust his judgement and guidance A true team leader, John uses his skills to empower staff to be the best that they can be. 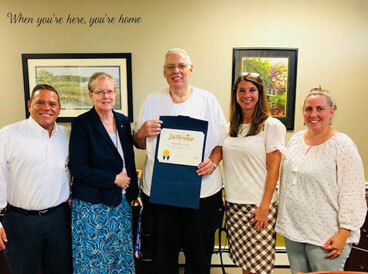 The Administration and Staff of Dominican Village are proud to join the New York State Center for Assisted Living in recognizing John Walters as its 2019 Nurse of the Year. Dominican Village celebrates Nurse and Volunteer of the Year! Dominican Village is very pleased to announce that two very dedicated individuals have been named New York State Center for Assisted Living (NYSCAL) Award winners! John Walters, LPN, is awarded 2019 Nurse of the Year and Kay McKiernan, is awarded 2019 Volunteer of the Year. We are privileged to have both John and Kay as part of our team of professionals who work tirelessly to live the mission, provide quality programs and ensure quality care for the residents of Dominican Village. Congratulations to each of them on this outstanding achievement, we are very proud of them both! John and Kay will be honored at the NYSCAL Annual Awards Banquet at the Turning Stone Resort and Casino in Verona, NY on May 7, 2019. 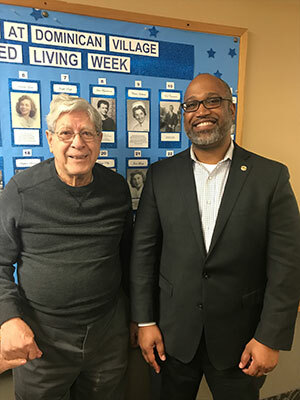 Suffolk County Presiding Officer DuWayne Gregory was on hand to tour Dominican Village’s recently renovated Independent and Assisted Living Buildings. Gregory’s work as an advocate for seniors is directly in line with our mission and services we provide at the Village. Resident Henry Fairchild was delighted to meet him! The Holiday season is here, and there is no better way to kick it off with our Annual Festival of Lights, which took place on December 6th! 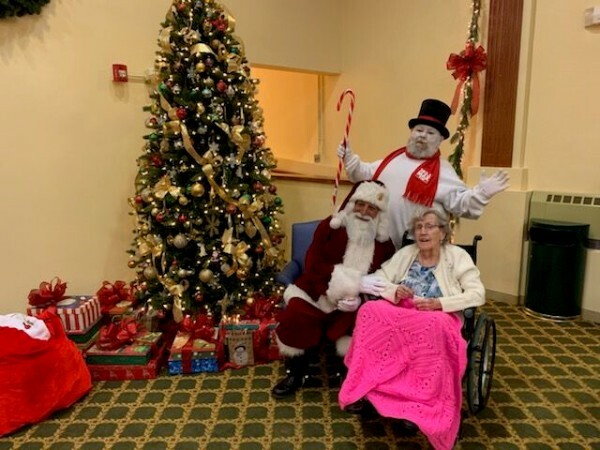 Santa and Frosty the Snowman made a special appearance much to the delight of the residents, their families and children. 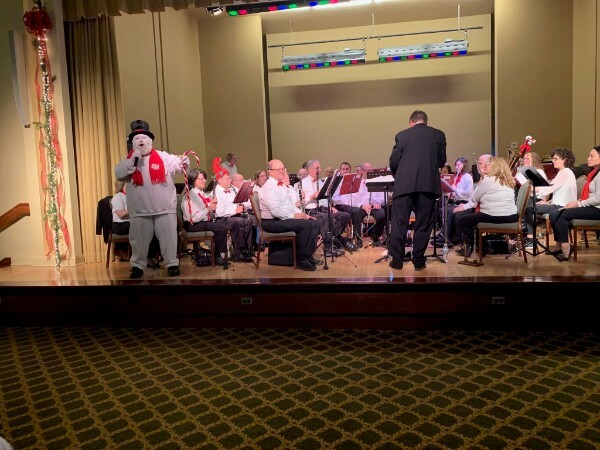 The North Shore Pops Orchestra entertained us with classic holiday music, which is always a highlight of our program. Dominican Village is grateful to Copiague High School Key Club members who volunteered and are most helpful as usual. Dominican Village sends their best wishes to all for a Healthy Happy holiday Season. 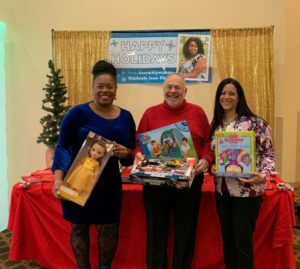 Making the Holidays a little merrier for local children and families, Dominican Village is proud to be a supporter of Assemblywomen Kimberly Jean-Pierre’s Annual Toy Drive. Christmas was definitely made brighter for children and families in our community. Happy Holidays From Dominican Village!! To kick off The Most Wonderful time of the year; the National Grid Choir arrived bright and early to Dominican Village to serenade the Residents with all the Holiday Favorites. We are grateful for their time and compassion to our residents. They brought joy, soulful sounds and many smiles! 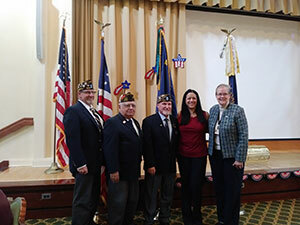 On November 8th Dominican Village hosted a very special luncheon for Veterans who served our Country. 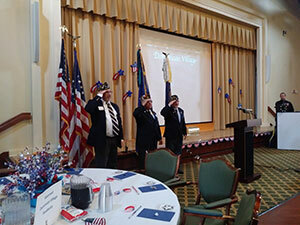 We thank the 175 Veterans who came out and celebrated with Dominican Village’s residents and staff who also served. We honor and Salute our Brave Veterans for their Service to our Country. 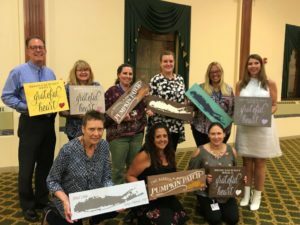 Approximately 50 professionals from a variety of licensed Home Care Agencies and Assisted Living Facilities networked, ate good food and showed off their crafty side. Dominican Village is looking for volunteers to assist us in implementing an array of artistic and cultural programs for the enjoyment of our senior residents. Contact Sarah Fitzpatrick for further information at (631) 842-6167. Dominican Village has been nominated for the Best of Long Island 2019 contest. We are asking for assistance in voting for Dominican Village. Voting begins today October 1st through December 15, 2018. During this time, votes are accepted one vote per category per day per person at bestof.longislandpress.com. This means the general public, you, family, residents and staff can each vote for Dominican Village once a day during this 75-day period. 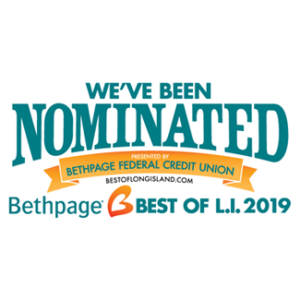 At the end of the voting period the nominee with the most votes in each respective category will be awarded the distinction of winning the "Bethpage Best of LI 2019." Hope you will vote and make us the best organization on Long Island! 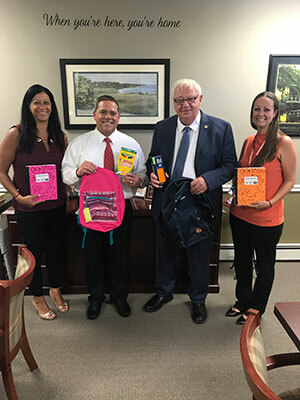 Dominican Village’s senior residents and staff were proud to partner with Senator John Brooks to sponsor a Back to School Supply Drive for Roosevelt and Wyandanch School Districts. 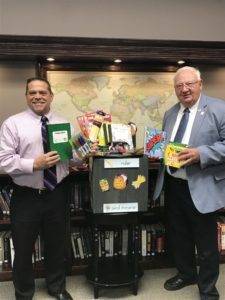 The residents and staff felt it was important that every child has much needed school supplies for the upcoming year. Everyone at Dominican Village would like to wish all local students a successful and rewarding school year. The Foundation for Quality Care, the New York State Health Facilities Association and the New York State Center for Assisted Living presented Dominican Village resident Henry “Hank” Fairchild a certificate in honor and appreciation of submitting artwork in the 2018 “Art from the Heart” program. 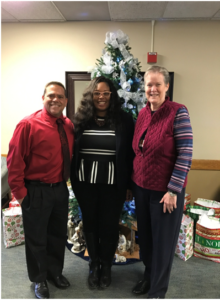 Photo Left To Right: Jennifer Ramlall Case Manager, Long time resident of Dominican Village Hank Fairchild, CEO President Paul Wasser & April Kinney Case Manager. 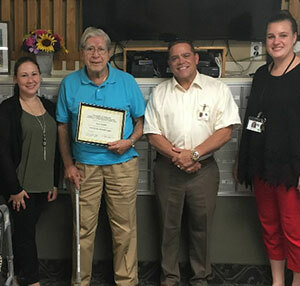 Dominican Village recently celebrated employee John Walters; LPN a dedicated Nurse Supervisor in our Assisted Living Residency. The National Centers for Assisted Living (NCAL), recently placed him in the “Making a Difference” class. John is a staunch resident advocate and caregiver. His compassion and unyielding commitment to “the Person” he cares for is unparalleled, stated Paul Wasser President/CEO of Dominican Village. John is “living the mission” he’s an employee whose job does not stop at his job description; we are very proud to have him as part of our Dominican Village Family. AMITYVILLE - Seven therapy dogs traveled to Amityville to bring some joy to seniors. 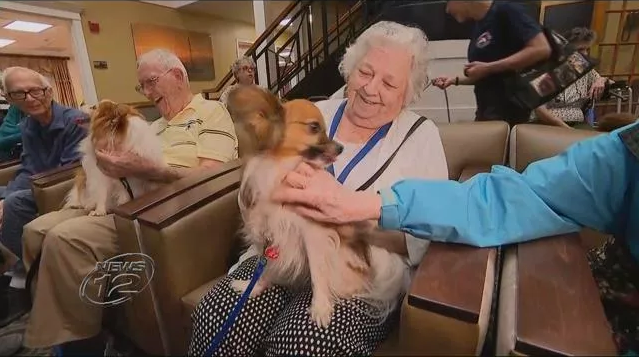 Paws of War brought the therapy dogs to the Dominican Village Assisted Living Community. Residents in the facility say it's an event to which they look forward. "We all just get so much from the pets," said Norma Cummings. "We get so much love and they seem to know. They take to us immediately because they're filling a void for us and it's absolutely wonderful." Paws of Wars is an organization that provides service dogs to veterans suffering from post-traumatic stress disorder. 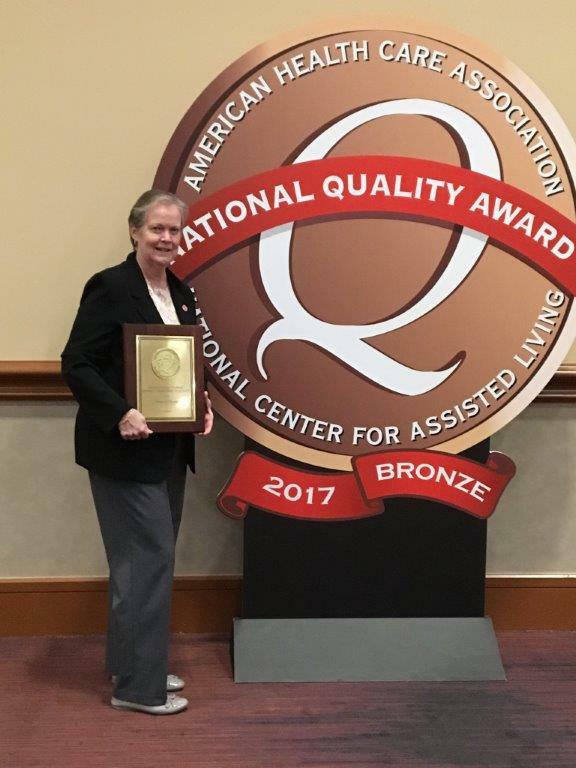 The American Health Care (AHCA) and National Center for Assisted Living (NCAL) has awarded Dominican Village its 2017 Bronze National Quality Award in recognition of its commitment to quality care. Long term and post-acute care providers receiving the awards numbered 520 and represented 46 states. Only six awards were granted in New York State. Dominican Village was one of two Assisted Living facilities recognized for its commitment to improving the quality of care for seniors and persons with disabilities. The award is the first of three distinctions Bronze, Silver, Gold possible through the AHCA/NCAL National Quality Award Program, which honors long term and post-acute care providers that have demonstrated their commitment to improving the quality of care for seniors and persons with disabilities. Acknowledging the award, Paul Wasser, President & CEO of Dominican Village, stated "Dominican Village is grateful for this recognition of our commitment to quality service for our residents and in our continuing efforts toward constant improvement; we look forward to applying for the 2018 Silver AHCA/NCAL National Quality Award." This year marks the 25th Anniversary of Dominican Village, senior housing and assisted living community a sponsored ministry of the Sisters of St. Dominic, currently serving over 260 residents. Dominican Village is also receiving an Enhanced Assisted Living Residence certification, a higher level license to allow aging in place. 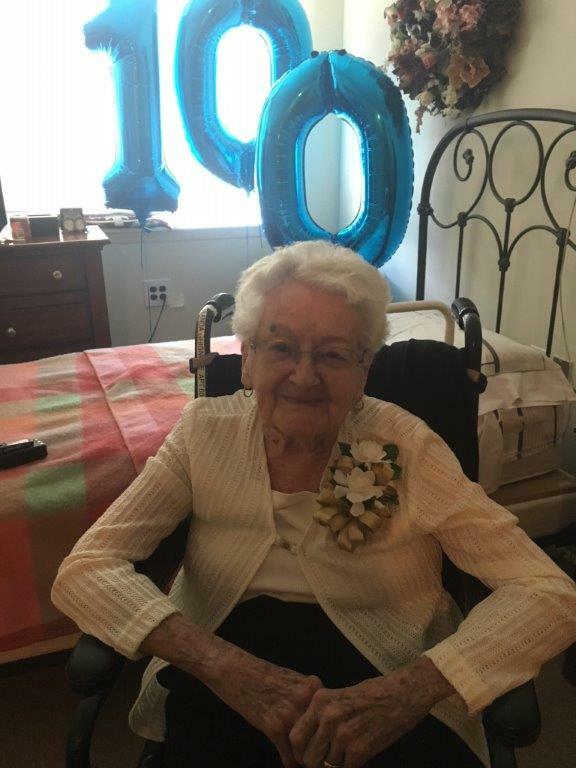 Yolanda Ghighone turns 100 years! 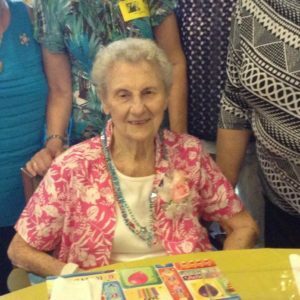 Dominican Village resident Yolanda Ghighone turns 100 years! Yolanda born May 2, 1918 in Manhattan, to Joseph & Josephine Cantamessa. Her Family later moved to New Jersey. She met Joseph Ghignone at a dance and they wed April 26, 1941. They lived in Queens and later, Amityville. Yolanda worked at Bloomingdales for 25 years, retiring at 65. She enjoyed traveling with her husband and did volunteer work at Ozanum Hall and Booth Memorial Hospital. She was widowed after 63 years of marriage. Yolanda enjoys reading and knitting. 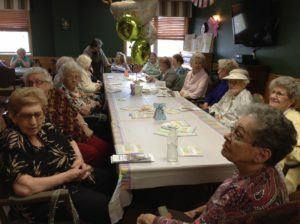 She celebrated her milestone with family & friends at a brunch at Dominican Village, where she lives. A resident since 2010 Yolanda attributes her longevity to happiness, laughter and love. Happy Birthday Yolanda and many more to come! 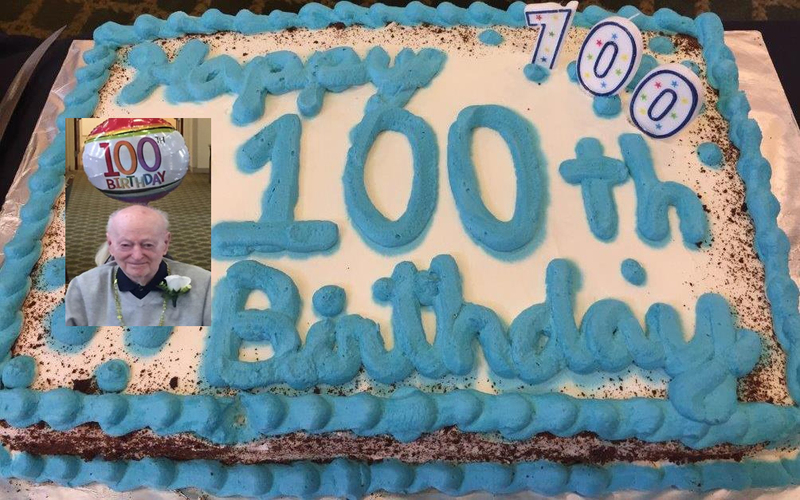 Steven Stanley turns 100 years! 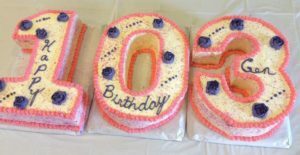 Dominican Village resident Steven Stanley turns 100 years! Mr. Stanley born April 25, 1918 served in the Air Core, met and married his wife Edwina; they were married for 73 years. Mr. Stanley retired from the NYPD back in 1965. The couple had four children and 10 great grandchildren. He celebrated his milestone with his daughter Pat and son Dennis. Fellow residents joined in on the festivities. A resident since 2008 Mr. Stanley attributes his longevity to the quality of life at Dominican Village. Happy Birthday Steven and many more to come! Dominican Village a member of the New York State Center for Assisted Living, was selected to receive distinctions awards by NYSCAL to individuals throughout the industry who present unique abilities in various areas of senior care. The awards recognize frontline caregivers and volunteers for their contributions that lead to improved quality of life for the residents and the work environment of their colleagues. Dominican Village is honored to announce two of its employees are recipients of two distinguished awards. Congratulations to Sherri Beverly receiving the Noble Caregiver award. 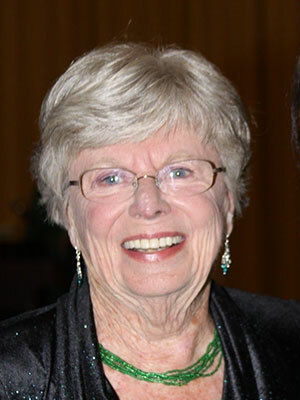 Ms. Beverly has been with Dominican Village for over 25 years as the Dining Room Manager. Congratulations to Stacey Louidice for receiving the volunteer of the year award. Mrs. Louidice a volunteer for over two years is being recognized for her outstanding contributions in assisting residents in various capacities and improving the global senior living experience. 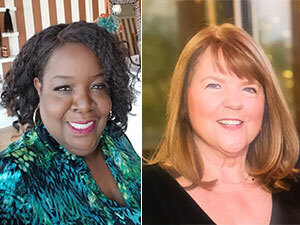 One of Dominican Village’s greatest accomplishments has been building our team to include so many individuals like Sherry and Stacey who share our vision to provide our residence with unparalleled amenities and services. Both employees will be honoured at the NYSHFA/NYSCAL Annual Conference in June in Rye, NY. 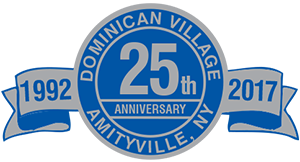 Dominican Village Celebrating a quarter century! Dominican Village founded and sponsored by the Sisters of St. Dominic of Amityville, NY, marked a quarter-century of providing quality Independent and Assisted Living senior care; celebrated at the Crest Hollow Country Club in Woodbury, NY. The night included heartfelt speeches of honorees, John G. DiLiberto, Rev. Msgr. James C. Vlaun and Prioress Sr. Mary Pat Neylon representing the Sisters of St. Dominic, who’s leadership and support of Dominican Village are vital to this accomplishment. A toast was raised to our incredible success over the past 25 years, and for continued success over the next 25 years. The day was a great milestone celebration. A big thank you to all of our sponsors, family and friends of Dominican Village….”When you’re here you’re home”. Left to Right pictured: Honoree John G. DiLiberto Dominican Village’s Chairman of the Board, CEO of Telecare and Honoree Rev. Msgr. 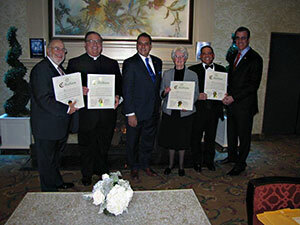 James C. Vlaun, Town Supervisor of Oyster Bay Joseph Saladino, Prioress Sr. Mary Pat Neylon representing honorees the Sisters of St. Dominic; Dominican Village’s CEO President Paul Wasser. 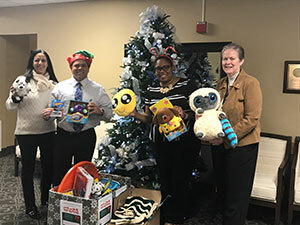 Dominican Village coordinated with Assemblywoman Kimberly Jean-Pierre in supporting the U.S. Marine Corp Toys for Tots Campaign; donating toys in hopes of brightening the holidays for children in our local community. Pictured left to right: Dominican Village’s Community Relations Director Emily Monem, Paul Wasser CEO, Assemblywoman Kimberly Jean-Pierre and Executive Vice President Sr. Maureen Muir. Broadridge Financial brought cheery smiles by providing a new computer center for the senior residents of Dominican Village. 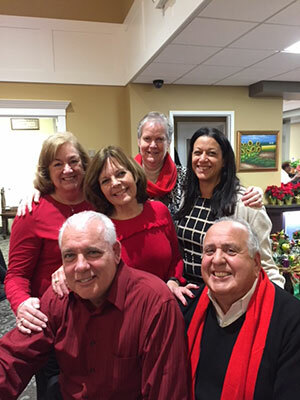 Pictured: Gerry Scavelli, wife Cindy and friends of Broadridge. TD Charitable Foundation contributes to Dominican Village’s “Get Up & Go” Program. 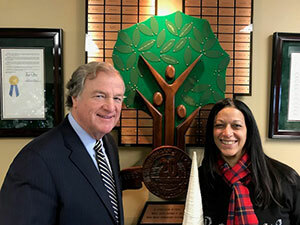 Pictured left to right: TD Bank’s CEO Ed Travaglianti & Emily Monem Dominican Village’s Community Relations Director. Learn more about Roosevelt School District here. Learn more about Wyandanch School District here. Mother’s day is a day for celebrating and thanking mothers and Dominican Village did just that! 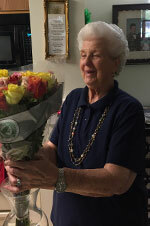 Bouquets of two dozen roses were hand delivered to senior residents. 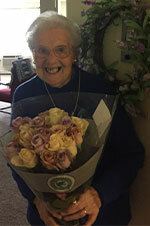 “Nothing compares to the joy of receiving fresh flowers on Mother’s Day”, said the residents. Dominican Village staff enjoyed the surprised expressions on the resident’s faces when they opened their doors. Their expressions of delight followed by smiles are priceless and are “Kodak moments”. 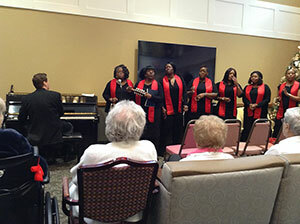 Dominican Village offers programs for seniors. For more information, call 631-842-6618 or visit us online. On Friday, December 16th Dominican Village residence received a cheerful gift from TD Bank Associates and Managers from several branches with an afternoon of Christmas Caroling. 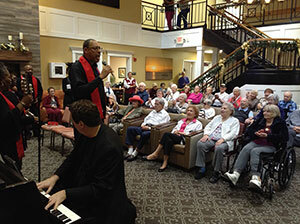 The joy of the season filled the halls as our residents joyfully joined in. Dominican Village thanks TD Banks Kathleen Petronis Vice President/Store Manager and associates who commit to volunteering every year to bring joy and love to our residents! 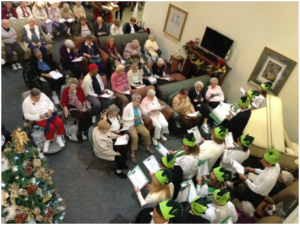 On Wednesday, December 7th Dominican Village residence were entertained for the fifth year, by the National Grid Choir. 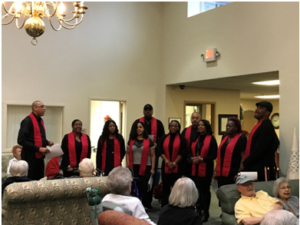 Under the direction of Mr. Kinkaid, a variety of classic and gospel holiday songs were performed with our residents gleefully joining in. Dominican Village thanks National Grid for volunteering during the holiday season! Dominican Village coordinated with Assemblywoman Kimberly Jean-Pierre in supporting the U.S. Marine Corps Toys for Tots Campaign. Beautifully wrapped toys were donated in hopes to brighten the holidays for children in our local community. 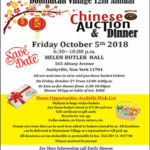 Dominican Village of Amityville recently held its 10th Annual Chinese Auction On October 7, 2016. The event was a huge success raising over $30,000.They gratefully acknowledge that this night could not have been possible without the generosity of our sponsors, family members, and our local business friends who understand the importance of the care and support that they provide for residents. 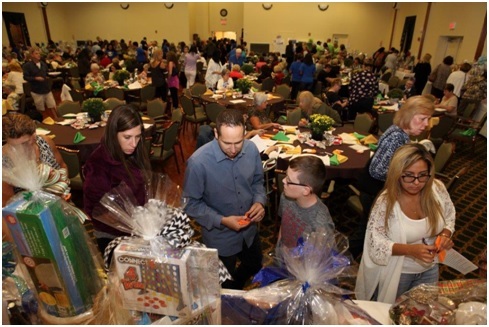 The net proceeds from this year’s Extravaganza exceeded last year’s by an incredible 75%! Such a jump is clearly attributed to the quality of the items that were available to those in attendance that evening. Everyone's support was a significant part of that success and will enable Dominican Village to purchase an innovative sound system with wireless headsets for the Helen Butler Hall. This state of the art equipment will now allow aging residents to become fully engaged when participating in events at Helen Butler Hall. The staff of Dominican Village is passionately committed to making a difference in the lives of our residents by providing services of the highest quality in an environment which promotes socialization, good health, and independent choices. 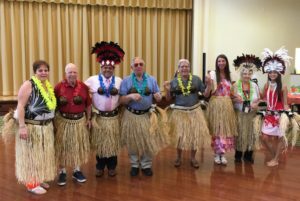 On August 5th Dominican Village senior residents got into the Hawaiian spirit by hosting its Annual Hawaiian Luau. 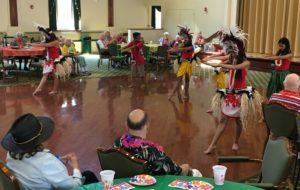 Resident enjoyed entertainment by Dance Aloha. Dance Aloha dancers mingled with our residents and employees and taught them how to quiver and shake their hips. Prizes were awarded to those with the most “Hawaiian” spirit. Please click here to see our press release of the amazing celebration. Mother's Day is a day for celebrating and thanking mothers. Dominican Village did just that! 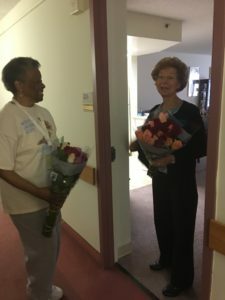 Bouquets of two dozen roses were hand delivered to our senior residents. “Nothing compares to the joy of receiving fresh flowers on Mother’s Day” said one of our 90 year olds. On May 5th Dominican Village senior residents got into the spirit in commemorating the Mexican Army’s victory over the French forces. 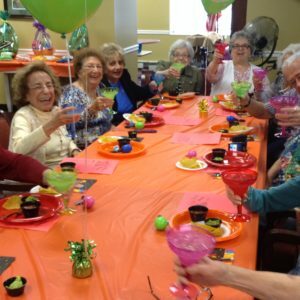 Seniors enjoyed homemade salsa, guacamole, toasted chips and margaritas. They were serenade by a local Mariachi band. A Collaboration to bring smiles to Mothers to BE! On March 31st, Dominican Village and North Amityville Kiwanis Club collaborated to provide local hospitals with well needed supplies and materials to assist mothers who are soon to have newborns. 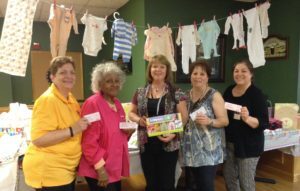 Dominican Village and North Amityville Kiwanis Club hosted a “Community Baby Shower” where over 75 residents and staff of Dominican Village came together to make this event a huge success. The generosity was stupendous to benefit newborns at local hospitals with essential baby items to help ensure healthy beginnings for the mother & newborn. Over 200 new items were generated from the Shower. Clothing, handmade blankets, diapers, showering gels are just a few items to name that were distributed among Good Samaritan, St. Joseph’s and Southside Hospitals. The Kiwanis Club of Amityville is a global organization of volunteers dedicated to improving the world, one child and one community at a time. To become a member please contact Louise Perrotta 631-412-3831. Theodora Tolle Tynebor was born in Brooklyn on March 11, 1911. At 19 years old she spent a year of study in Rome. When her mother was there to visit her, the two crossed into Germany to attempt a visit with her father’s family. While witnessing a parade honoring Adolf Hitler they were told to “Macht Der Heil” (Salute Hitler). Teddy beams when she recalls her mother saying “I don’t do that, I am an American”. Teddy attended St. Agnes Academic High School in College Point, NY, where she was taught by the Sisters of St. Dominic. She then attended Marymount College in Tarrytown, NY, after which she received a Masters degree from St. John’s University. She then pursued a career in the NYC Public School. 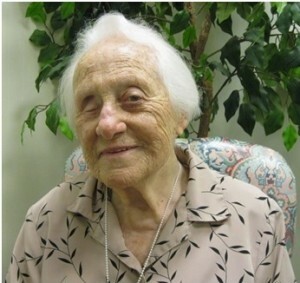 Teddy has resided at Dominican Village since May 2006 and is best known for her funny jokes and warm personality. The Administration, Staff & Residents of Dominican Village are elated to be celebrating Teddy’s 105th birthday with her as she still brings a zest for life to the Dominican Village Community. Dominican Village (DV) is pleased to announce Mr. Paul F. Wasser, as their new President and CEO. Mr. Wasser brings over 21 years of health care experience to DV. He began his career as a clinician in Physical Therapy. He has earned an A.O.S. in Occupational Studies; a B.S. in Health Administration, and holds an MBA in Health Care Management. Mr. Wasser’s experience ranges the full spectrum in health care including work in acute, sub-acute, skilled nursing, head injury, assisted and independent living settings. Mr Wasser’s administrative expertise combined with his clinical knowledge and experience will be of great benefit to the Dominican Village Retirement and Assisted Living Community.